I had three quilts in the Washington State Quilters show this weekend, no awards this time around. There were over 500 quilts and 50 vendors and a great show to attend. It is a very traditional show with one small modern quilt category. Unlike the other categories modern quilts are awarded ribbons based on attendee votes. It is not a juried show so it is not uncommon to see quilts designed by person x, pieced by person y and quilted by person z. 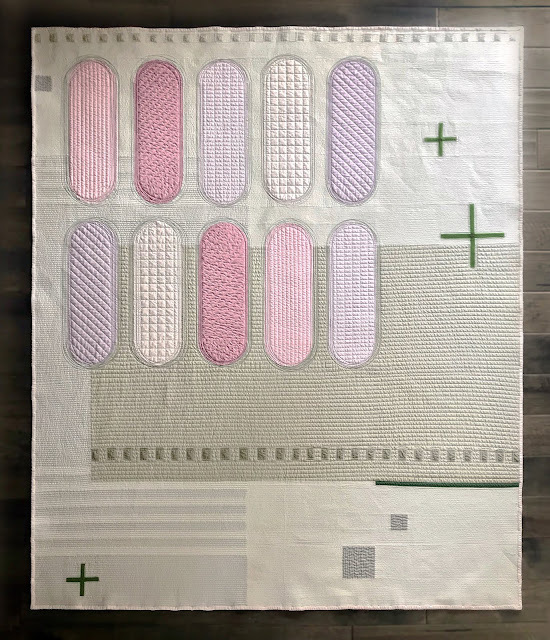 My impression is the most valued part of a quilt in this show is the quilting which leads me to why I titled this post 'Room for Improvement." My quilting needs help! Yet another goal for next year, work on my free motion quilting. I've decided to make Monday's Free Motion Monday and use some of my leftover blocks to work on quilting. If I ever want to improve I need to practice, so goes life. There were also some really great vintage quilts on display. Next year I'm hoping to submit a quilt with some fairly decent free motion quilting.